Manchester design agency LOVE has won a three-way pitch to design an immersive Gin Distillery Experience in Manchester for Quintessential Brands–owned, Thomas Dakin. The distillery, which received full planning permission in 2018, is already under construction with the aim of opening to the public early Autumn, 2019. 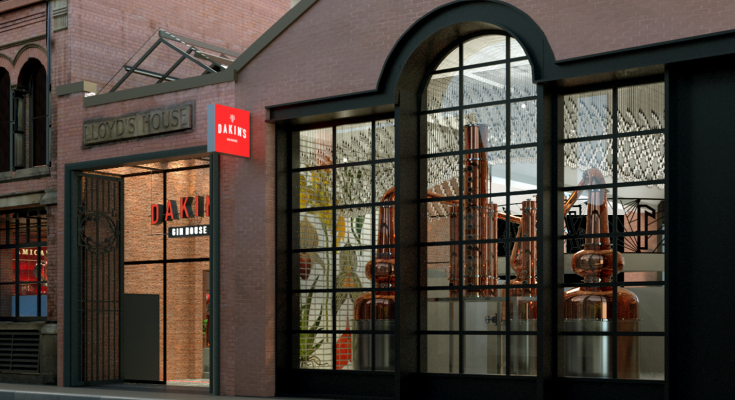 The gin distillery will be located in the heart of Manchester between Deansgate and Albert Square, with three craft copper pot stills taking pride of place behind the distillery’s impressive glass frontage. Alongside the working gin distillery, the venue will be filled with experiential and personalised moments that include a gin bar, an Instagram-enabled event space for hospitality events, and entertainment. The Thomas Dakin Gin Distillery is expected to become one of the city’s top tourist attractions, with 70,000 visitors expected in the first year. The experience will create more than 50 jobs and will have the capacity to produce over 1 million bottles of gin every year, ensuring the growing global demand for Thomas Dakin Gin is met. The new distillery will continue the legacy of Thomas Dakin, the 18th-century visionary who pioneered the development and refinement of quality English Gin and set the benchmark for London Dry Gin in 1761. Inspired by his passion, commitment to craft, and his entrepreneurial attitude, Thomas Dakin plan to add more gins to its collection, combining traditional techniques created by Dakin himself, paired with modern methods to break new ground in craft gin. Trevor Cairns, CEO of LOVE, commented: “Thomas Dakin has a rich heritage in innovation, but an even more exciting story in its craftsmanship and ambition to become the most desired distillery in the world – which is a great brief to be a part of. Having designed brand experiences all over the world, it’s particularly special to be creating one in our hometown, Manchester”. LOVE, the multi award-winning agency, has a long-standing track record in designing innovative consumer experiences around the world, from the award-winning Johnnie Walker Houses in Asia, to the iconic Guinness Storehouse in Dublin.